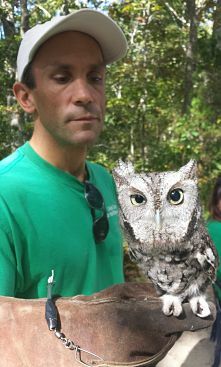 During March of this year, we received an unlikely visit from a wild Eastern Screech Owl (Otis asio) (see sightings listings) in what must have been Mother Nature’s way of saying, prepare yourselves for what’s to come. 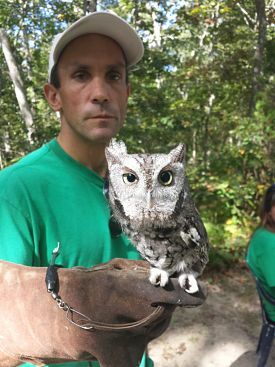 Sure enough, later that month, we received our very own Screech Owl which is no less wild, but partially impaired due to a retinal detachment in its left eye. Of a list of potential names that school groups helped create, the winner was Kokokehom (“Koko” for short), a Wampanoag Indian name that fits perfectly the mystical qualities an owl possesses. Anyone approaching (or having the pleasure of handling) Koko, wouldn’t remotely associate the bird with any visual handicap. The large eyes, fixated within large sockets of a head that can turn 270 degrees around, are in tune to your every twitch. Koko’s keen sense of hearing picks up where the eyes leave off; the owl’s head quickly turning at the slightest crunch of a leaf under one’s foot. During the six months we have had Koko, we’ve gradually added perches to the mew, such that one isn’t quite sure where Koko will be sitting when we enter to feed, clean the cage, or take him out for a stroll. This actually is an important consideration, as the owl’s wings are fully functional, and Koko knows where to find the door! As what might be considered an antidote to the realities of life in captivity, this screech enjoys fine dining in-tune with its voracious appetite, with a healthy supply of two to three mice provided daily. Through Koko’s feeding habits, we’re able to catch a glimpse of the owl’s wild tendencies. As a means of hiding their prey, owls may swallow a portion of their kill whole (sometimes removing the head first), then fly to cover to finish the meal, thereby avoiding competition from other predators. Our owl morbidly consumes the head first, sometimes leaving the rest for later consumption! This grizzly detail is actually important, and a key factor in any research to determine what prey items are being consumed. Because owls have no crop to digest hair, bones, and feathers, they regurgitate pellets daily that contain these items. Through pellet analysis, one can often determine exactly what the owl has recently eaten. 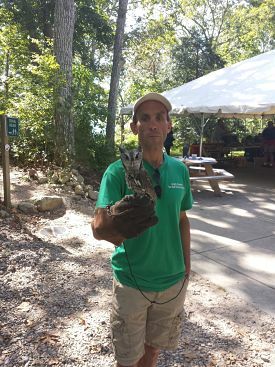 The more civilized side of Koko was on display at our annual Biodiversity Day Wrap-up/Fall Fun Fest on Saturday, September 28, when the owl faced its largest audience yet. While certainly alert to the situation, Koko calmly accepted the enthusiasm of awestruck children. Fortunately, Koko is quite tame and relaxed around people. The two important messages passed along at this event were that, first and foremost, the owl is in captivity only because it cannot survive in the wild. Second, Screech Owls are a very common predator and so, like all wildlife high on the food chain, are important regulators of our ecosystem. Our Screech Owl also serves as an educational tool for the biodiversity concept, which stresses the interconnectedness and importance of all species around us, both large and small. On any biodiversity type venture, one has a better chance of unveiling a reptile or amphibian, unique vernal pool invertebrate, a rare plant, or a colorful songbird, with some persistence. 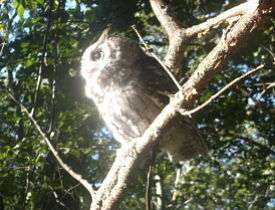 In a lifetime, one may never encounter a Screech Owl in the wild. Stop by the Lloyd Center and check out our raptor cages, with the Screech Owl directly next door to our now long-time resident Red-shouldered Hawk. A peak into the cage might be rewarded with the owl quietly sitting on its perch, where Koko will surely be looking back at you!